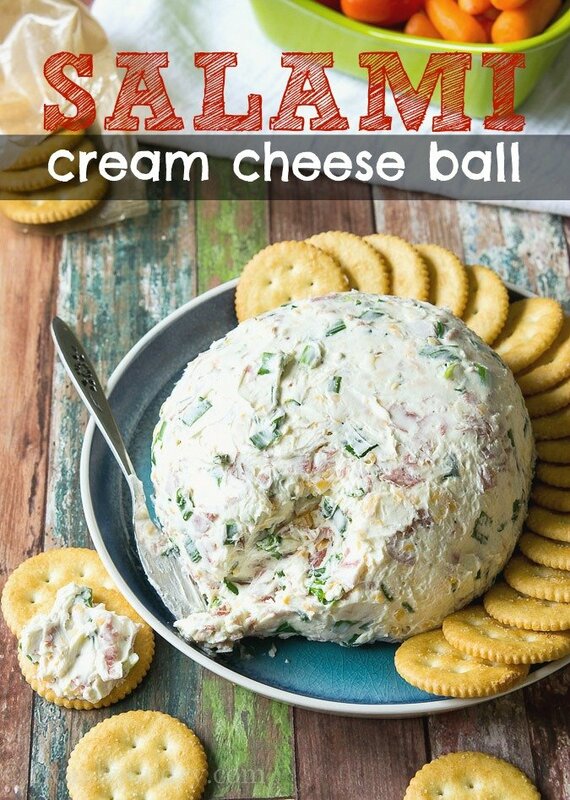 This super easy Salami Cream Cheese Ball is filled with cream cheese, diced salami, cheddar cheese and a few spices. Definitely a crowd pleaser! 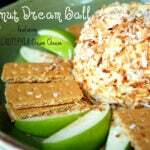 I have been dreaming about this Salami Cream Cheese Ball for quite some time now. 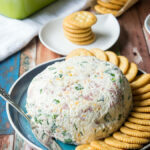 Several years ago my sister-in-law came to my house for a visit and she whipped up the most amazing cream cheese ball that was stuffed full of chopped salami and green onions. It seemed almost too simple, but when smeared on a buttery cracker?? With football season upon us, I knew it was the perfect time to unleash this bad boy on you. 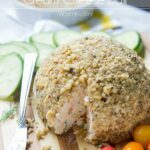 You could roll the cheese ball in chopped walnuts like I did for this Smoked Salmon Cream Cheese Ball or if you’re really adventurous, try rolling it in some chopped bacon! Yum! I kept the nuts off because I wanted to be able to send some to school with my kids in their lunch boxes (they go to a nut-free school). Anyways, I lurve this cream cheese ball. 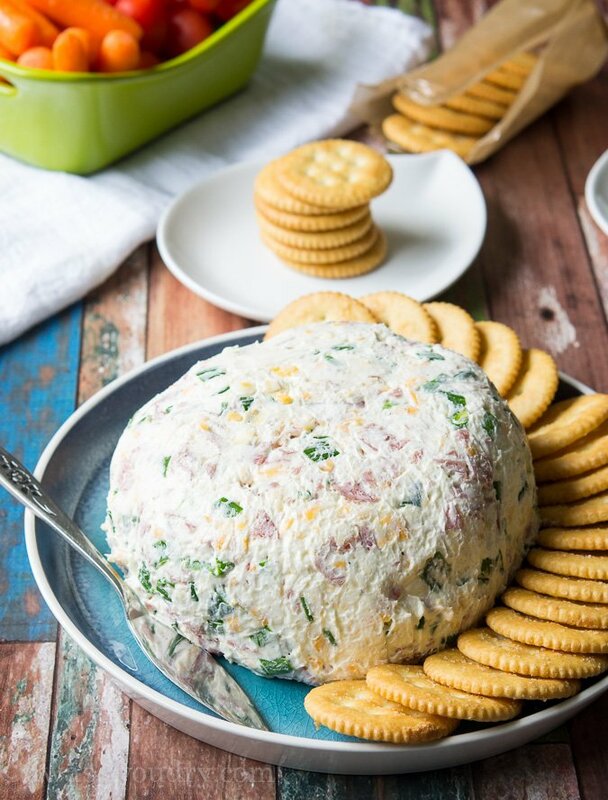 So if you’re planning on hosting a football party, a holiday party, a baby shower, a girl’s night or anything in between there, you’ll definitely want to bring along this cream cheese ball and loads of crackers (carrot sticks and sliced cucumbers work well too). 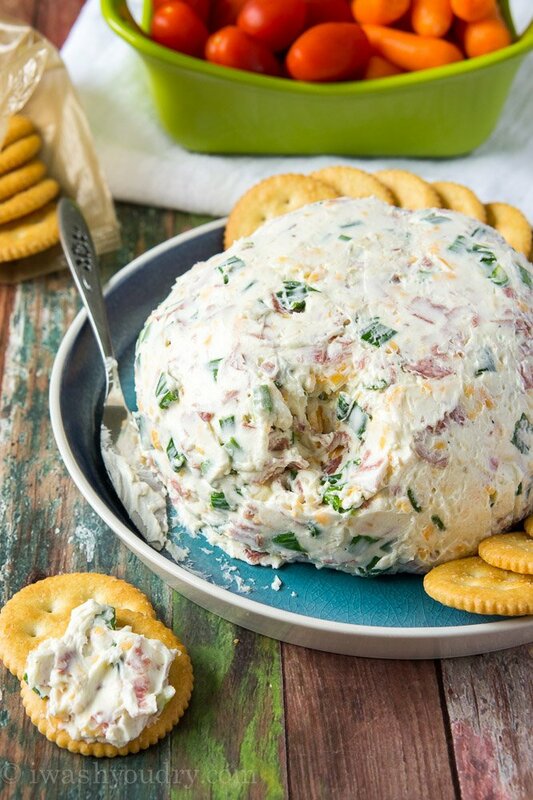 Salami Cream Cheese Ball is a flavorful and creamy delicious appetizer that’s filled with cream cheese, cheddar and diced salami! Combine all the ingredients in a stand mixer fitted with the paddle attachment and blend until evenly mixed. Pour cheese ball onto a sheet of plastic wrap and place another sheet of plastic wrap on top. Form the cheese into a ball (or whatever shape you want), and then chill for 20 to 30 minutes. Serve with butter crackers and fresh cut veggies! 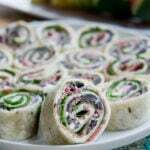 *to soften cream cheese quickly, unwrap the cream cheese and place on a microwave safe dish. Microwave each brick of cream cheese separately for just 20 seconds. 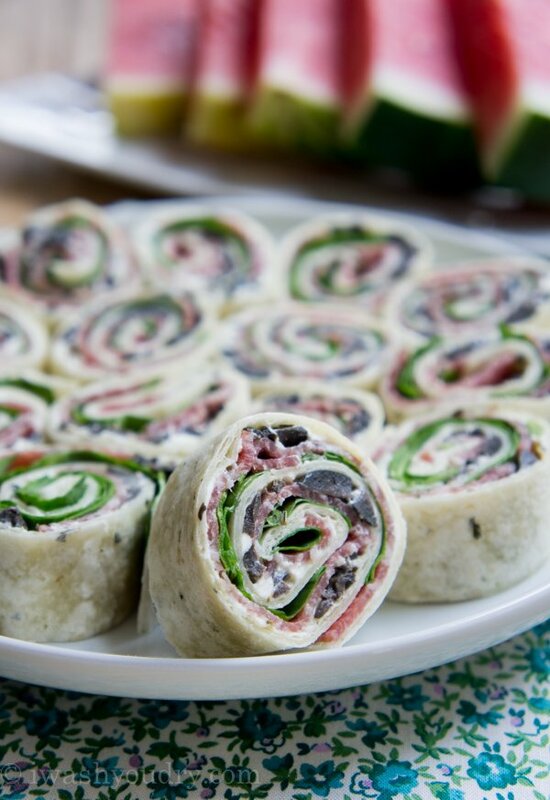 You may also enjoy these Salami, Olive and Cream Cheese Pinwheels! I don’t have a machine with a paddle! Can you use a hand mixer? When did I ask this same question? Yes! You can use a hand mixer! Some chopped green olives (or black) would be a good addition! This has all my favorite ingredients for a cheese ball. Will be making this. Made this for a Memorial Day party and it was a big hit! Everyone asked for the recipe. Good flavors. Found you through Pinterest. This recipe was a hit at work! My first ever cheese ball! This has all our favorites! I think it will be a sure hit with the men…. or should I say boys. Oh my gosh. I think I might make this next weekend for my book party! 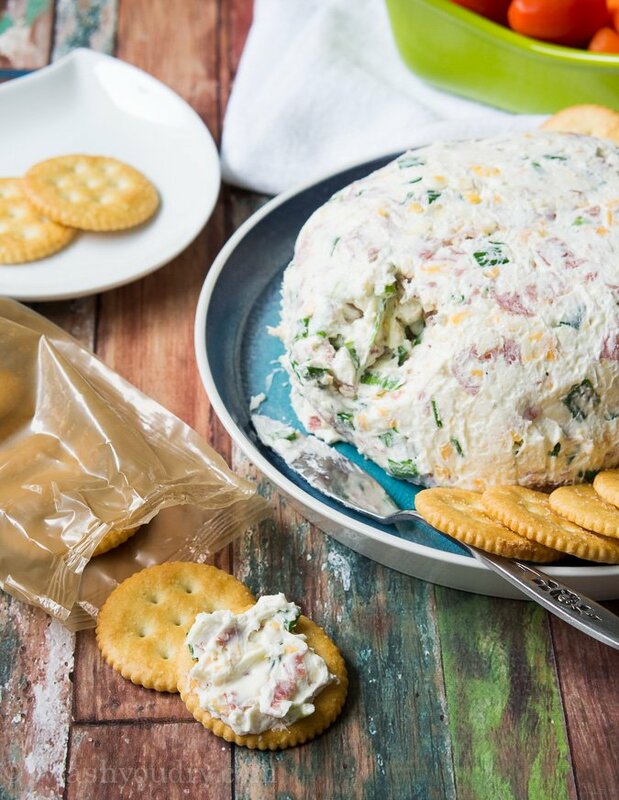 What a great and cheap idea for a cheese ball. I don’t think I have seen one like this. I like it. Cheese Balls rock! I am very fond of Yochee (yogurt cheese), I use it in place of cream cheese for just about everything. I make my own these days. All you need to do is place Greek yogurt (or regular yogurt, just takes longer) in a sieve lined with a coffee filter, place the sieve over a bowl and cover. Refrigerate and allow the whey to drip for 2-3 days; when it is the consistency you want use it just like cream cheese.